No one has failed to notice that the current generation of youth is deeply -- some would say totally­ involved with digital media. 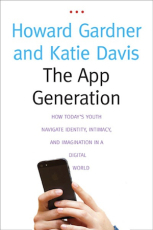 Professors Howard Gardner and Katie Davis name today's young people The App Generation, and in this spellbinding book they explore what it means to be "app-dependent" versus "app-enabled" and how life for this generation differs from life before the digital era. Gardner and Davis are concerned with three vital areas of adolescent life: identity, intimacy, and imagination. Through innovative research, including interviews of young people, focus groups of those who work with them, and a unique comparison of youthful artistic productions before and after the digital revolution, the authors uncover the drawbacks of apps: they may foreclose a sense of identity, encourage superficial relations with others, and stunt creative imagination. On the other hand, the benefits of apps are equally striking: they can promote a strong sense of identity, allow deep relation­ ships, and stimulate creativity. The challenge is to venture beyond the ways that apps are designed to be used, Gardner and Davis conclude, and they suggest how the power of apps can be a springboard to greater creativity and higher aspirations.